The Cultural Learning Alliance (CLA) is a collective voice working to ensure that all children and young people have meaningful access to culture. Arts and culture are a life-enhancing and essential part of our existence. They bring pleasure, participation, self-expression and essential skills into children’s lives. By speaking with one voice and working together, we can realise our ambition for all children and young people to have an entitlement to quality cultural learning. The Alliance brings together the diverse parts of the cultural sector to work together – including museums, film, libraries, heritage, dance, literature, new media arts, theatre, visual arts and music – with the education and youth sector, with parents and with young people. 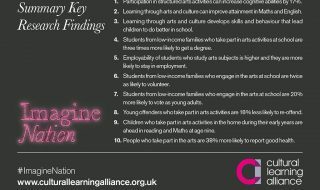 A report revealing the impact of learning through arts and culture on vital measures of success including educational attainment, employability, health, and increasing social engagement.